Bomber pilot in WW1. Born on New Year’s day 1900, second son of Clarence Beesley, surgeon, of Exmouth. Educated at Epsom College; joined RNAS Dec 1917 as Probationary Flying Officer, posted to 120 Squadron at Cramlington near Newcastle on its formation (1/1/1918). (Eventually equipped with DH9s, the squadron was intended to reinforce daylight bombing forces in France but never saw operational service.) Gazetted Temp 2nd Lieutenant, RAF on 28/09/1918; served in France and awarded British War and Victory medals. 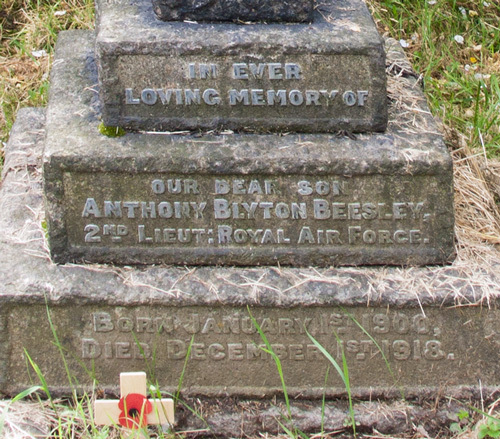 Died Dec 1918 at the VAD hospital, Huntingdon (septic pneumonia following influenza).